Jean Harley Was Here explores how those left behind navigate life after the sudden death of a loved one. After Jean Harley, wife, mother, dancer and friend, is fatally injured while riding her bike, she leaves a gaping hole in many lives. Her husband copes by focussing on their young son, while her best friends Neddy and Viv struggle to maintain their friendship. The novel spans more than a decade and is told by each of the major characters. The writing is tender and poetic, and the characters’ pain is palpable. And yet, it is a story about hope and life. Charley, the former prisoner the novel arley won’t survive an accident while riding her bike. her husband, young son, Orion, mother-in-law, Marion, American mother, Pearl and best friends Neddy and Viv struggle to make sense of the tragedy and of life without her vibrant presence. 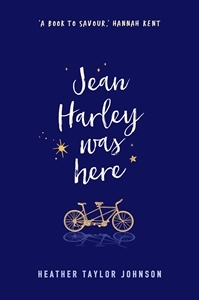 Jean Harley Was Here is a beautiful novel about grief, love, relationships and the long-lasting and unknowable impact we have on those around us. It is the second novel by American born poet, Heather Taylor Johnson.